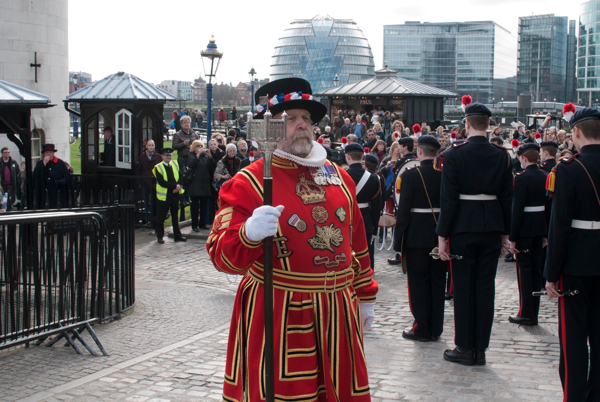 And he gave a private smile because, as a seasoned military man, he is alive to the ambiguity of this tradition which began in the fourteenth century – admitting later that one of his predecessors John de Cromwell was put on trial for piracy in the fourteenth century. Nowadays, the Constable’s Dues is purely ceremonial and the only involvement with piracy recently was when the American ship that rescued the British hostages from the Somali pirates in the Gulf was invited to participate as a gesture of thanks. 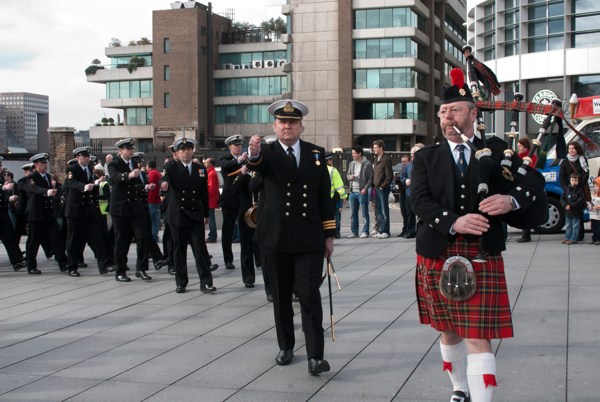 Yet I learnt that morning that HMS Westminster would be departing for Libya immediately after the ceremony, due to the escalating crisis there, and it emphasised how integral the life of the Tower is to the armed forces, manned by Yeoman Warders who are all ex-servicemen. 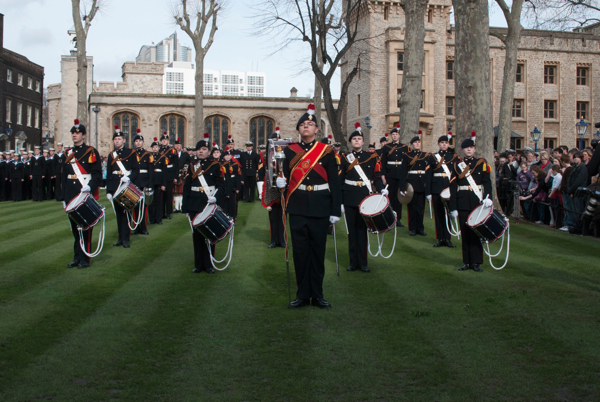 When I arrived at the Tower to meet Lord Dannatt, an hour before the ceremony, the fresh parallel stripes upon the lawn at Tower Green were the first hint that something was afoot. Days before, the scaffolding had been removed from the mythic eleventh century White Tower, revealed gleaming in the Spring sunshine after a three year programme of cleaning and renovation. 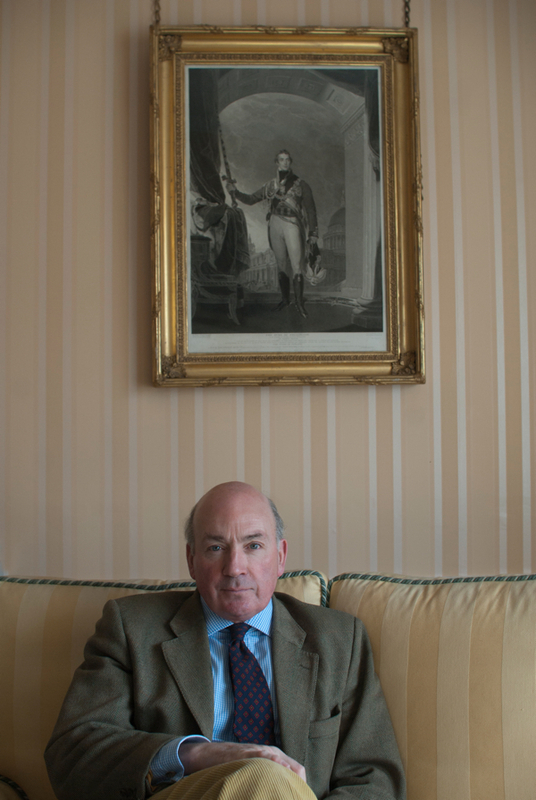 Lord Dannatt sat on the couch beneath his most celebrated antecedent as Constable of the Tower, the Duke of Wellington, and explained that his is the most senior position at the Tower, in one of the oldest offices in the land, dating back to within a few years of the Norman Conquest. 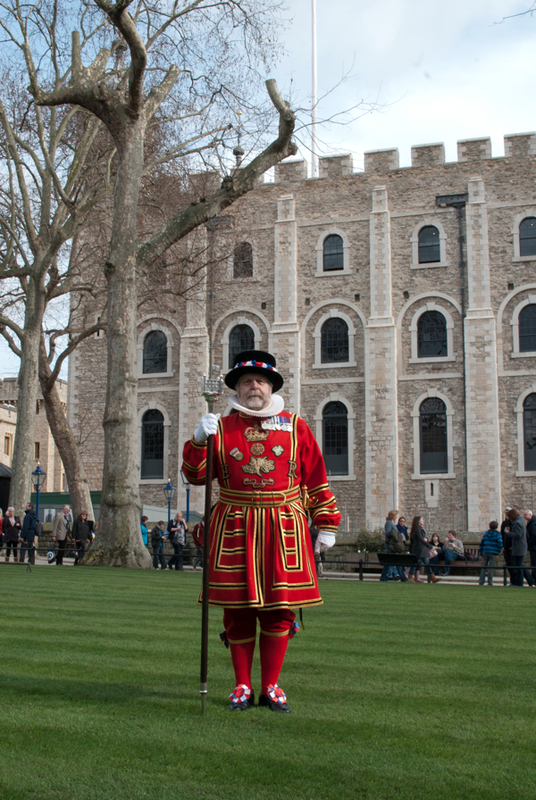 He told me the Iron Duke was Prime Minister twice whilst Constable of the Tower – a feat he did not intend to rival. Instead wanted to tell me about the fine choir he has encouraged in St Georges Chapel within the White Tower, where members of the public may come to a service any Sunday morning without the requirement of buying a ticket. 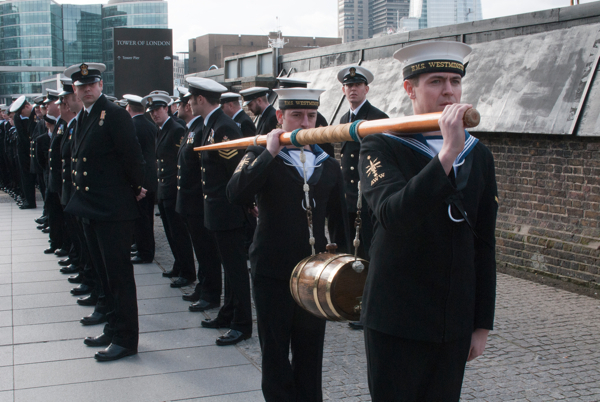 Then when he went off to change into his regalia, and I walked down to the waterfront where a drum band was stationed at the entrance to the Tower and sailors from HMS Westminster under the command of Tim Green were arrayed in ranks outside, two in front carrying an oar upon which was slung the crucial keg of wine – the Constable’s Dues. 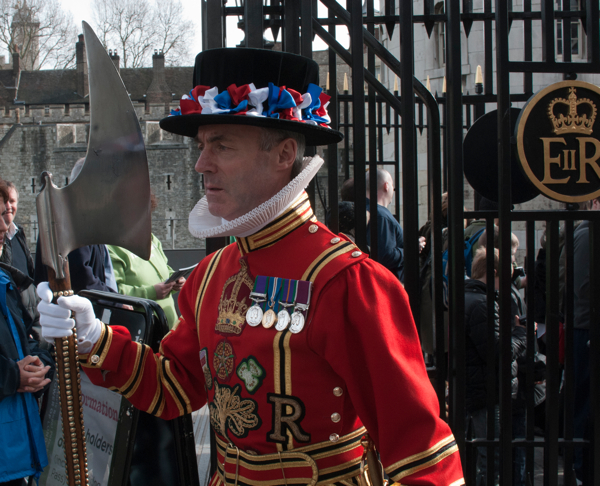 Yeoman Warders in their ceremonial red uniforms trimmed with gold braid were in evidence, scurrying through the tourist crowds with silver maces and staffs with ferocious blades mounted upon them. There was a certain frisson among the visitors who were puzzled by these strangely dressed men, like the ghosts of another age. 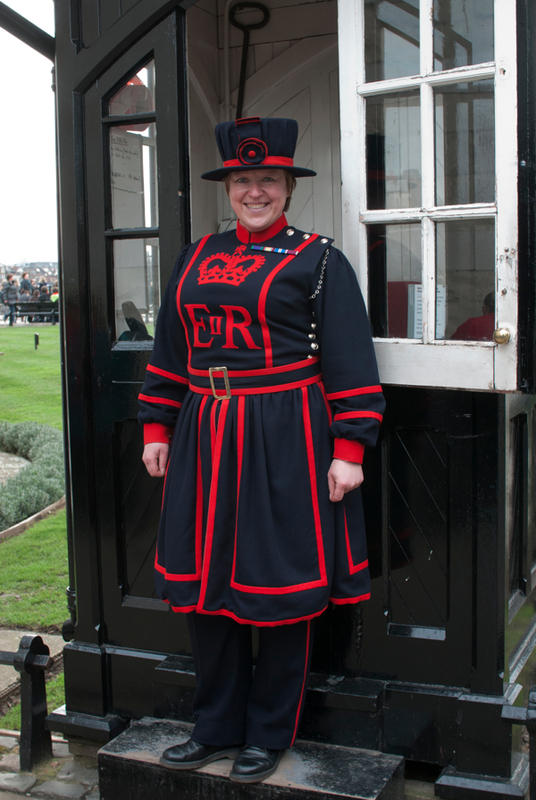 Yet the reality was the converse, the Yeoman Warders were enacting a ritual which is six hundred years old while the tourists were interlopers of the modern day. 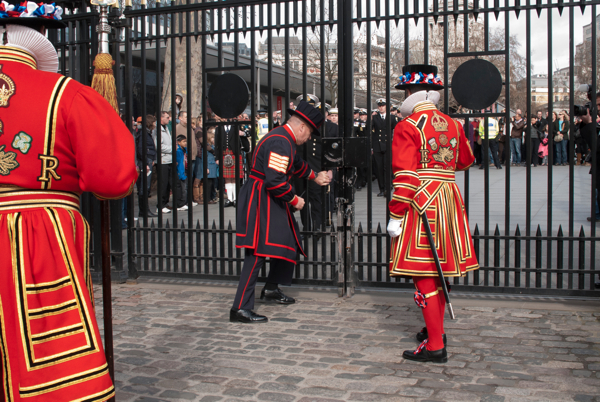 At midday, the Yeoman Warders swung the gates shut and Commander Tim Green approached, requesting entry. Then “words were spoken” in theatrically-raised voices – that I did not hear exactly – but which amounted to a negotiation in which the keg of wine was offered to the Constable in return for the ship’s passage up the Thames. 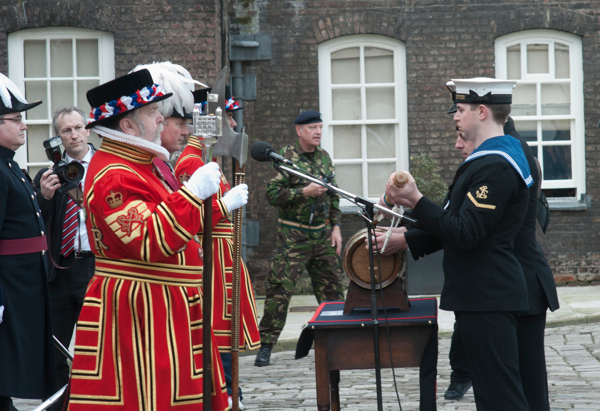 John Keohane, the Chief Yeoman Warder, operating on behalf of the Constable duly accepted the offer and the gates were opened to admit the crew. 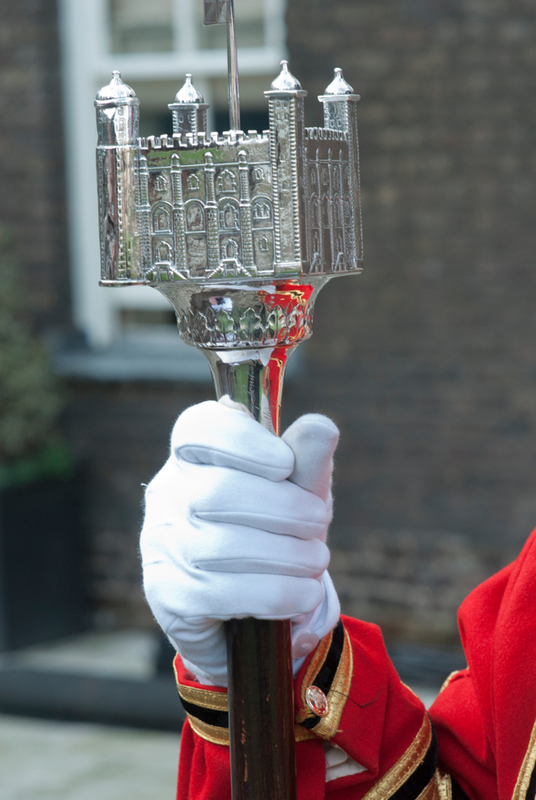 Then John, with a dignified spirit that few could rival, led the procession with his mace in the shape of the Tower upon his shoulder. And as I followed, running alongside the drum band and the sailors marching in rank, through the narrow roadways and overhanging stone arches of the Tower, with the sound reverberating all around, I had the feeling of experiencing history – of an event played out for centuries in this ancient mysterious space that was designed for it, and has been here longer than anything else in London. In those moments, I was the ghost witnessing hundreds of years passing before my eyes in endless processions marching through. It was the seduction of pageantry. “Can I ask you something?” I enquired impertinently, as we shook hands,“Is there anything inside the keg?” And he looked at me in surprise. 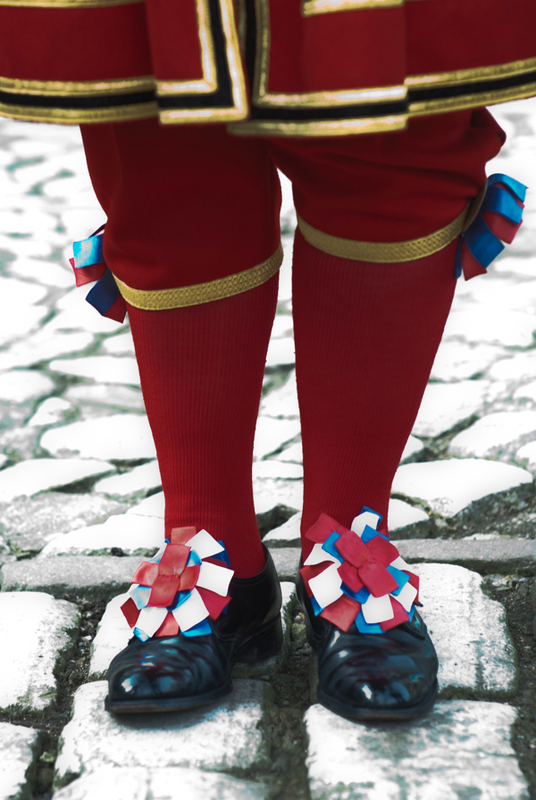 “Wine!” he said, breaking into radiant smile, looking at me in a quizzical fashion as if I had entirely missed the point,“We’ll decant it into bottles and enjoy it after the parade on Easter Sunday.” Then, in that moment, I understood everything which happened that morning anew. 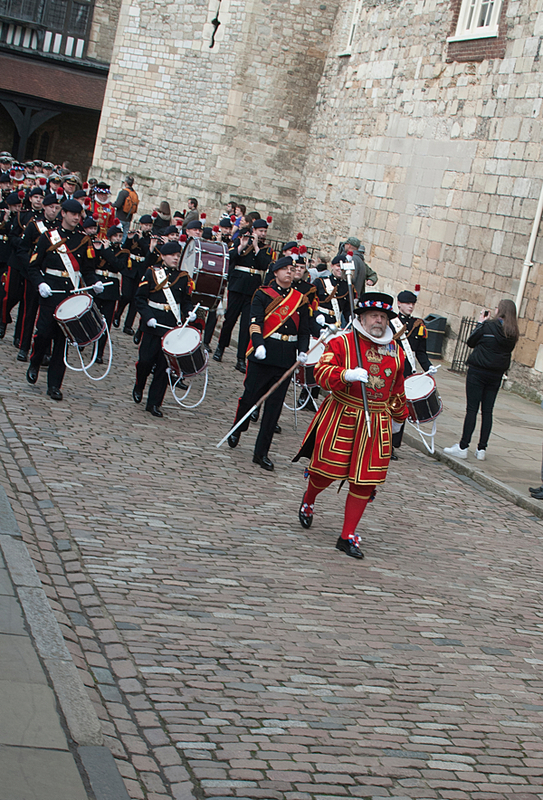 Although a ceremony, it was no mere performance but a ritual with vivid and authentic meaning for the participants, because the Tower of London is not where history was enacted – it is where history happened, and these people recognise they are part of that continuum stretching back over a thousand years upon this spot. “Back in the mists of time…” as the Constable put it. 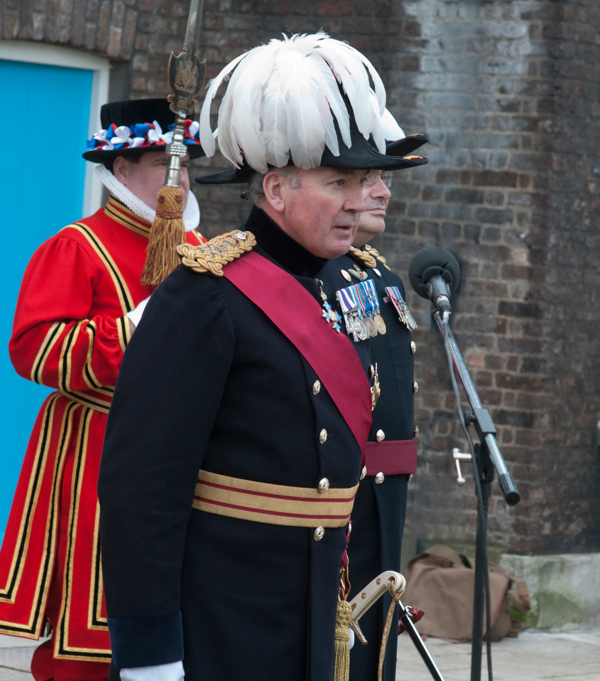 Lord General Richard Dannatt, Constable of the Tower of London, with the Duke of Wellington – his most celebrated predecessor. The keg of wine as the Constable’s Dues. 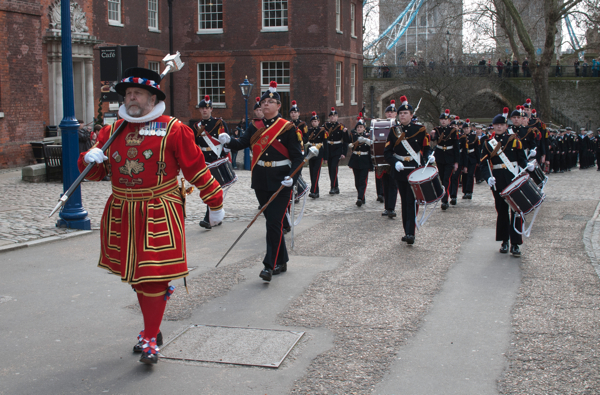 The Chief Yeoman Warder leads the procession followed by the drum band ahead of the ship’s crew with the Constable’s Dues. 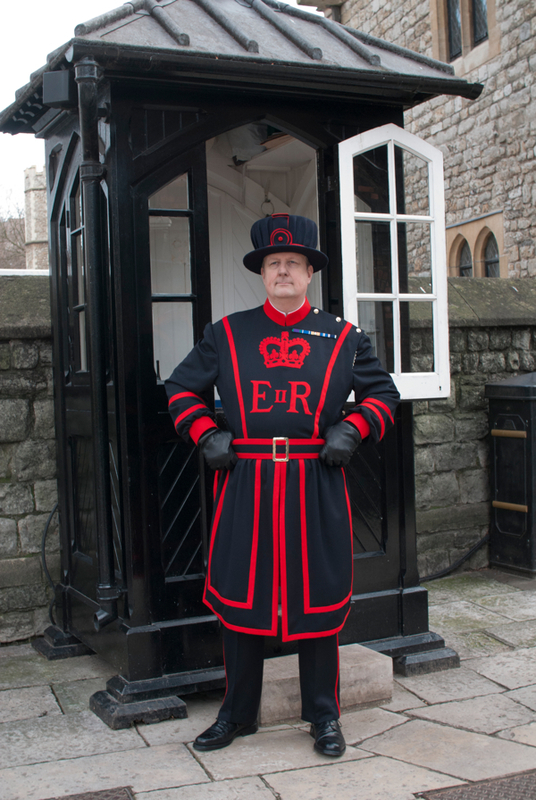 Lord General Richard Dannatt in his uniform as Constable of the Tower. 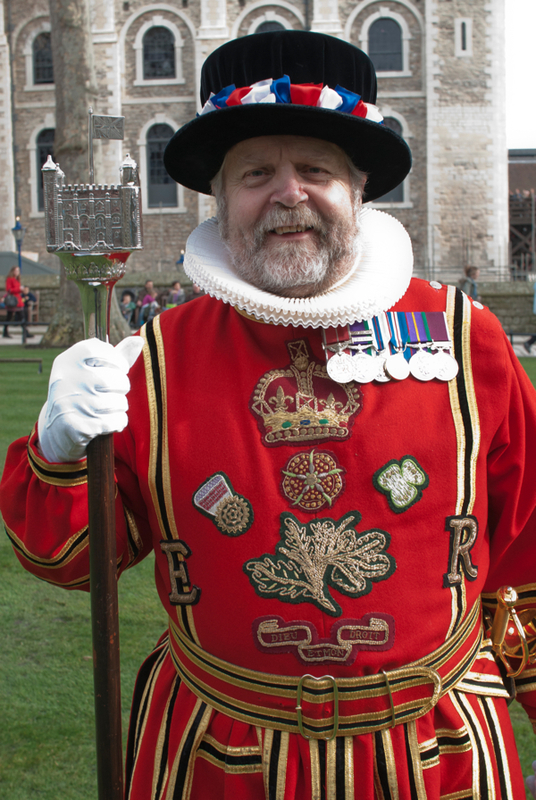 The Tower and pageantry and silver topped staffs — it doesn’t get better than this! Thanks for serving up a nice slice of history to take the edge off a Monday morning. So pleased I found this today. Thank you Gentle Author. 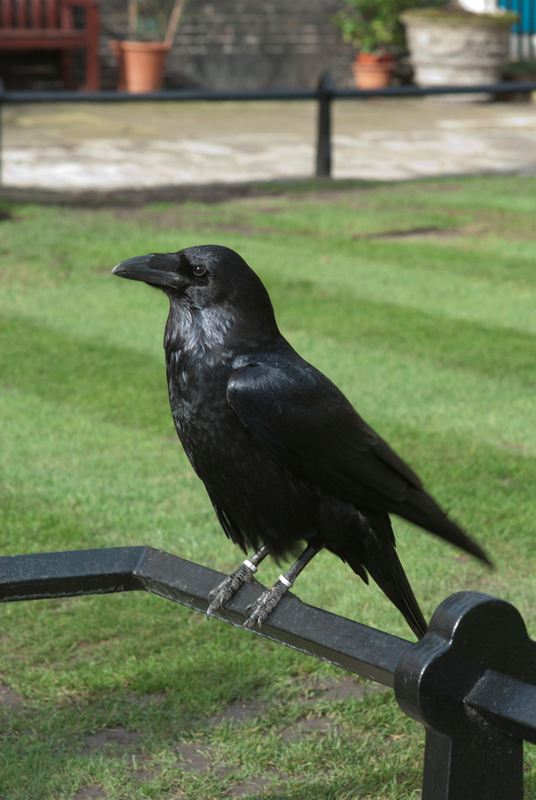 Even after my sixth visit to the Tower of London I still must have one more visit. In my years of studying the history of our Kings & Queens, no other building brings home the truth of what happened here to many of our most prominent historic legends who’s lives ended in terror and death. And yet as I and my husband walked through the same grounds and the through the same rooms as those brave souls who through one thing or another found themselves prisoners of their King or their Queen, the sun always shone filling the Tower and grounds with such beautiful light it was as though the Tower was saying, “I am innocent of the actions of those bloody years that have passed and stand tall and with pride as the Royal Palace that I was originally built where the Kings and Queens awaited thier Coronation”.